Kousa dogwood is a species of flowering tree native to Japan and Korea and is a relation of other Cornus species native to North America. They are prized for their large bracts in spring, decorative red berries in summer and their richly colored fall foliage. They do not require regular pruning, except to remove occasional damaged or dead wood. 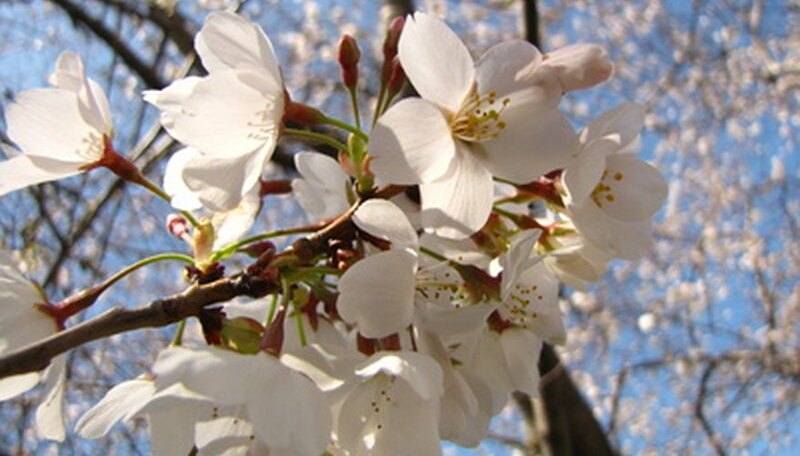 If they require pruning, it should be conducted immediately following bloom in the late spring or early summer, according to Purdue University. Kousa dogwoods produce their flowers on year-old wood. Cut out any dead, cracked, abrading or otherwise damaged branches. Place the cut back to a point of healthy wood or back down to the parent branch from which the problem branch originates. Place all cuts on the bias just 1/4 inch above a leaf node or bud or just outside of the slightly swollen branch collar where two branches meet. Thin the interior of the canopy if needed to increase sunlight penetration and fresh air flow. Prune away branches that grow inward toward the trunk and those that cross or abrade one another. Spread the thinning cuts throughout the canopy evenly to preserve a balanced shape. Reduce the length of the branches only when needed to improve access around the tree, such as when it overhangs a walkway or is brushing up against another tree canopy or structure. Remove just the branch length necessary and place the cuts 1/4 inch above a leaf node or bud.